Five years ago, as I was making the transition from corporate world to “my new world,” I discovered the art of feltmaking. Had you asked me 10 years ago what felt was, I probably would have told you that it was something that they put on pool tables and in boots, as liners. Today, the word “felt” has a very different meaning to me. Feltmaking came into my life at just the perfect moment. Handling the wool, working with my needle or feeling the warm, soapy water on my hands is like therapy. When I can do it outdoors in the sunshine, it’s even better. The steady process of felting becomes even more magical when the loose fibers become felt. As I’m not a “pattern” person, felting has given me the opportunity to design and create shapes that are uniquely mine. They come from not only my brain, but my heart. Each design is unique and represents all the love that I can put into it. Creating dancing ladies, garden goddesses, vessels and bird pods sustains my enthusiasm. As I tell my friends, I don’t have enough life left to do all the projects in my head, but I’m certainly going to give it a good try! With warm sunshine and gentle breezes, I work in my garage studio for hours, trying new techniques and creating wool pieces that warm my heart and soul. I’ve never felt better. Kathleen is a self-taught fiber artist, designer and instructor of felting workshops in New England. 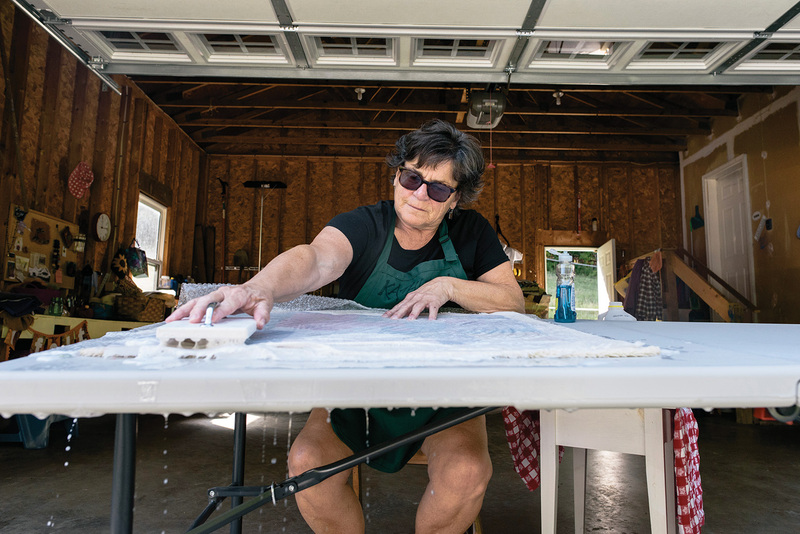 She lives in Falmouth, and when she’s not felting, she’s spending time with her family, painting, reading and walking the beaches of Maine.